Over the past few months, I’ve written a lot of articles to help promote Career Mums. You’ll find an extract in this month’s Madison, a story coming up in Cosmopolitan Pregnancy, a series of stories on kidspot.com.au, and a range of others. All different angles on the rich subject matter that is working mums. One story has given me more food for thought than others. I interviewed Emma Grey from WorkLifeBliss for an upcoming story. Emma is one of the experts who features in Career Mums, and she is my go-to girl for simple tips about balancing work and home life. I won’t give too much away, but I wanted to share one quote from the story that really stood out in my mind – and which neatly sums up much of her advice in our book. I used this quote with gay abandon (fully attributed of course) last week when I was talking to a group of businesswomen about how working mums can make time for themselves in the melee of work and family life. But the same advice could be directed at writers. 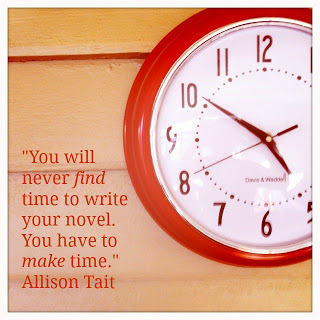 Just as you will never write your book if you wait for the perfect place in which to write it, so too you will never write your book if you wait for the perfect time. You have to fit it in. Get up early if that works for you (as it never has for me). Stay up late. Write when the baby is sleeping, or when the children have a rest after lunch. Squeeze it in. I don’t think I’ve ever put aside an entire day to write. It would scare me. I would end up cleaning the fridge and washing the windows instead. Over the past eight years, I’ve written four published books, one soon-to-be published novel, three unpublishable romance novels, and the opening chapters of a children’s book. These were my ‘side projects’, written in and around and between countless mortgage-paying magazine articles and the fulltime, then part-time, then full-time, then part-time care of my two children. I am now child-free, during school hours, five days a week. If I had waited for the perfect time, I’d probably just be starting out now. Or washing my windows. If you’re struggling to find time to write your novel, my new on-demand course ‘Make Time To Write’ will help to get you started. All details here.